The first movie, The Reef (also known as Shark Bait) was released way back in 2007. It told the story of Pi, a young fish who became separated from his parents and years later ends up living on a tropical reef where he falls in love with celebrity fish Cordelia. Of course the path of true love never runs smooth and a nasty shark, Troy tries to win Cordelia. Pi learns martial arts from Nerissa, a turtle and eventually fights off Troy and lives happily ever after with Cordelia. The sequel to The Reef - Reef 2: High Tide was released in the US a year ago and has been released in a number of other countries over the past 12 months however it goes on release in UK and Ireland this Friday, 25th October 2013. The main characters are back again for the sequel with Pi being the main character. In the first movie Pi was voiced by Freddie Prinze Jr, however Drake Bell takes the voice for the sequel. Cordelia, Pi’s other half is back and played by Busy Phillips, having been played by Evan Rachel Woods in the original movie and the shark, Troy is again voiced by Donal Logue. The sequel sees Pi and Coreilia with a young son, Junior who is voiced by Frankie Jonas (of Jonas brothers fame). The turtle Nerissa is also back and is again voiced by Rob Schneider. 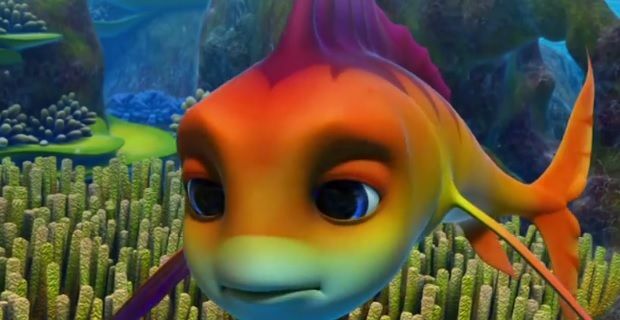 A new character, Ronny appears in the reef and he is voiced by Jamie Kennedy. With Troy having been fought off in the first movie and Pi having won his love interest away from him Troy returns to the reef to exact revenge. Troy and his shark gang await high tide to attack the residents of the reef. Having learnt martial arts in the first movie from his mentor, Nerissa the turtle, Pi decides that he cannot fight off Troy the shark by himself and sets to work training the others on the reef in the art of water fu. Ronny, a new fish on the scene arrives on the reef and begins to distract the reef residents. He throws out new ideas to protect the reef but secretly he is a spy for Troy. Eventually Troy captures Cordelia and it is up to Pi and his son junior to save her with the help of his newly trained friends and let all the creatures of the reef return to their peaceful existence. The first movie was considered a commerical flop. Many have drawn comparison to more successful movies such as Finding Nemo and Shark Tale. If you had kids loving the first movie, 6 years on they are likely to be almost too grown up for the sequel, Reef 2. However, Reef 2 can be watched without seeing the first. The sequel so far hasn’t wowed the critics but if you have young kids it is sure to entertain as a cute, well animated movie and at 80 minutes long it is perfect length to keep little ones attention. Catch The Reef 2: High Tide in cinemas from Friday or given its release over a year ago it is already available on DVD.